Hazardous Level: Silver fish are not a health risk. They will eat starchy things like paper glue, so if you have collectible books, magazines or comic books in your basement (where it's damp) they may ruin those items. Multiplication Level: Silverfish will lay several hundred eggs in her lifetime. Silverfish are a long, slender insect with long antennae and three long tail-like appendages at the top of abdomen. 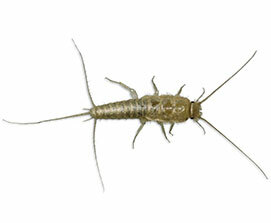 Silverfish are silver-grey in colour and measure 12mm long. Are Silverfish Hazardous to humans? No. Silverfish cause minimal household damage to clothing and paper materials. They are considered nuisance rather than a health hazard. A female Silverfish lays several hundred eggs in her lifetime, at a rate of 2-3 eggs per day. Eggs are laid in cracks with the young reproducing at three months. If left untreated Silverfish infestation will occur rapidly. If I have an infestation of Silverfish what can I do? It is recommended to seek the services of a trained Pest Control professional, like Anypest, to eliminate pests for thorough results. We will remove the pest and suggest ways to minimize your chances of future Silverfish infestations. Every home is set up different, however one way is to keep your basement dry and free of old newspapers and magazines. Another thing we will look at is potential breeding spots, such as clogged eves, or planters that are close to your home.